Lentils and dried peas have a mild, earthy flavor. They hold their shape after cooking but also are easily mashed or pureed. For quick soups, choose from split peas—either green or yellow (milder and sweeter), brown lentils, black-eyed peas, or heirloom pigeon beans (small, nearly round, beige with orange spotting). Ratio: For split pea, lentil, or black-eyed pea soup, the ratio of liquid to solid is about 4 to 1; for example 4 cups water or stock to 1 cup split peas (1 cup of dried split peas or lentils = ½ pound). Increase liquid proportionally if you add vegetables or meat to the cooking pot. The amount of liquid and peas or lentils you use will vary with the number of servings you want; a pound of dried peas or lentils should make about 10 servings. Liquid: For a vegetarian meal use vegetable stock, for a non-vegetarian meal use chicken stock or white stock or ham stock (ham stock is commonly used with split-pea soup). Heat liquid. Bring the liquid—water or stock–to a full boil in a large heavy-bottomed soup pot (a large, wide, heavy pot is used to ensure even cooking). Add solids. Add peas or lentils and other vegetables and flavorings such as meat slowly enough that the liquid continues to just boil—gently stir. Aromatic vegetables and meats can be sautéed in advance—see below for suggestions. 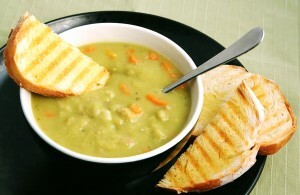 Unlike beans, peas and lentils do not require soaking before cooking. Simmer. Cover the pot, reduce heat to a simmer, and continue to cook until the peas or lentils are just tender with a creamy texture—20 minutes to two hours depending upon the amount of solids. Stir occasionally to make sure solids do not stick to the bottom. Remove any foam or impurities that rise to the surface. Season. Near the end of cooking add salt or other seasonings. Always taste before salting and seasoning. Tasting as you go will ensure just the flavor you want. Purée (or not). Once tender, peas and lentils can be served whole, partially whisked or mashed in the pot, or removed in part or whole and pushed through a sieve or puréed in a blender—choose the texture most satisfying and complementary to the occasion. If you remove the lentils or peas to purée, return them to the pot and return the soup to a simmer before serving. If the soup is too thick, add some water or stock. • Vegetables. Sauté aromatic vegetables over medium heat in advance: add enough olive oil to coat the bottom of the pot or a separate pan then add aromatic vegetables—celery, carrots, and onions or leeks or potatoes evenly chopped, and cook until just soft and translucent (about 5 minutes), or until lightly browned or caramelized (about 15 minutes). Add garlic and rosemary or a bay leaf and thyme or cumin (ground or leaves) or chopped tomatoes or yellow squash and chopped basil or minced fresh parsley or cilantro or grated ginger–or chopped chiles or cayenne or curry powder (for a spicier version)–to the saucepan and cook briefly to release their aroma. A splash of balsamic vinegar or red wine or Worcestershire or Tabasco sauces are other flavoring choices. Vegetables, herbs, and seasoning can be added to the simmering peas or lentils at the outset, or can be added near the end of cooking—with about 10 minutes to cook. If you are cooking meat in the soup, add the vegetables near the end so that they don’t overcook, lose their individual flavor, or become bland. Your objective is to meld the flavors. Taste as you go. • Meat. For a meaty split pea soup, a ham bone or ham hocks can be simmered or roasted in advance before being added to the liquid and dried peas—do this if you want a particularly meaty soup. Otherwise, a ham bone or diced ham, prosciutto, or bacon—or a combination of these–can be added to the split peas and water or ham stock at the beginning of cooking. If you use a ham bone (bone-in ham), pork shoulder, or ham hock you want to allow enough cooking time so that the meat falls off the bone—this may require an hour or two. The meat that does not fall of the bone can be cut off, diced or cubed, and added to the soup. Ham will likely add all the salt and seasoning you need for a rich, full-flavored soup (the fat will melt into the liquid). Cooking everything in the pot at the same time can result in the peas being overcooked and mushy—by the time the ham is tender. A drizzle of olive oil stirred in at serving will add aroma to the air. Garnish with cilantro leaves and a squeeze of lemon. A dollop of yogurt added to each bowl will enrich the soup. Serve with crusty garlic croutons or chickpea chips. Serve with crackers, crusty toasted bread, or biscuits. Serve with fluffy rice for a more substantial dish. Leaf lettuce with a light vinaigrette dressing and a drop of honey for sweetness can be served on the side. Sliced pears and apples will nicely complement the earthy flavored peas and lentils. 4 cups of water to 1 cup of split peas is way, way too much water. The soup will be very thin. Should be more like 2.5:1 or 2:1, especially if keeping the lid on while cooking. Those ratios will give more of a pilaf than a thin soup. I’d do 3:1 if I were just making a 1-pot soup like you describe (sautee aromatics, then add water + peas and simmer to finish).